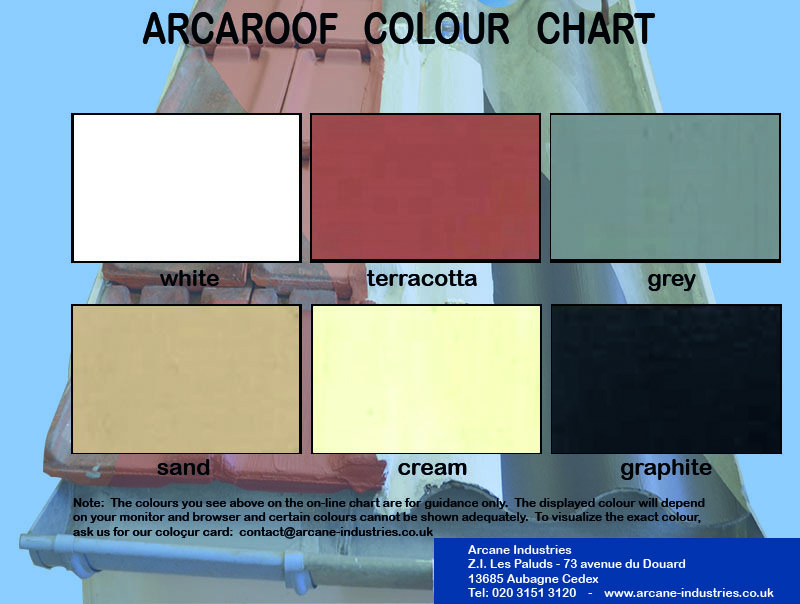 ARCAROOF ROOF WATERPROOFING designed to WATERPROOF ROOF AND ROOF PARTS. Repair and waterproof flashings, cracks or broken roof tiles with this elastomeric roof membrane which applies like a paint, as simply as a paint! A mixture of acrylic resins, inorganic pigments and various additives emusified in water, ARCAROOF is much like paint in appearance, technology and application. ARCAROOF applies like a paint with standard painting equipment and dries to a continuous, opaque film with a paint-like appearance. When used with ARCAMESH, ARCAROOF will seal open pores, cracks and small holes. The reinforced waterproofing system applied will stretch, compress and resist breaking when the substrate moves, or if existing cracks expand and contract. The surface treated will remain waterproof despite movement and strain. The waterproofing membrane will protect the surface fom air-borne chemicals, fungus and water-induced deterioration. ARCAROOF + ARCAMESH can be used to waterproof the entire roof surface (minimum slope 1 to 3%) or specific parts of the roof presenting a waterproofing problem. ARCAROOF is a high viscosity, thixotropic liquid emulsion. Applying pressure during application causes the waterproof product to flow and spread over the surface, building a relatively thick film which will bridge hairline cracks and fill small voids. Note: ARCAROOF will repair micro cracks but should be used with ARCAMESH, our reinforcing fabric, to repair and waterproof larger cracks and construction or expansion joints between slabs and parapets. See our APPLICATION VIDEO which illustrates the reparation of a cracked roof tile and active cracks over small surface areas using ARCAROOF and ARCAMESH. Flashings are the weakest part of any roof, particularly susceptible to weathering damage and exposure over time. Flashings must provide a watertight cover between roof sections (the intersection of two roof planes referred to as a valley) and between roof parts and the roof structure (chimney flashings, plumbing vent flashings, eave flashings, etc.). 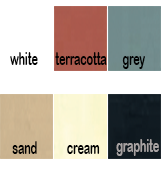 ARCAROOF + ARCAMESH can be applied over just about any building material: concrete, fibre cement, shingles, wood, zinc, everite, slate, galvanized steel, polyester, aluminum, plastic ...to prevent water ingress through these weak areas. The parapet wall is unique in that it is the only part of the building subjected to weather wear from both sides. The vertical to horizontal joint between the parapet wall and the roof surface is particularly susceptible to water ingress if not reinforced with an excellent waterproofing system such as ARCAROOF and ARCAMESH. Damage due to temperature swings and exposure over time will weaken the vertical to horizontal joint and cause leaking. These areas should be given special attention when waterproofing or reinforcing the waterproofing of your roof. Depending on the damage and placement of the parapet wall, a double layer of ARCAMESH may be necessary to consolidate the structure and provide a superior waterproofing solution. For more explanations and illustrations, see the product date sheet for ARCAMESH. Reminder: ARCAROOF will withstand light foot traffic on an occasional basis. For heavier or frequent foot traffic, use ARCADECK. Read our tips& advice for application in damp or rainy climates. Do not apply if rain or snow or strong winds are present or imminent. The elastomeric waterproof roof coating will cure well under normal climatic conditions (20° C, dry weather). In damp or rainy climatic conditions, we recommend postponing application if possible until the dry season or applying ARCAROOF in thinner layers and 4 coats : 1 primer coat and 3 thin coats instead of 2 normal ones. In all seasons, cover the surface areas in the shade with a tarp to limit water absorption during drying. Ferrous metal surfaces must be treated with a rust inhibitor product prior to application. If the surface is corroded or vulnerable to heavy corrosion (steel or aluminum surfaces), use ARCAROOF ANTICORROSION. Scrape and brush off all moss. The surface must be disinfected with a fungicidal product such as ARCAMOSS. Wait 24 to 48 hours before applying ARCAROOF to a treated surface. Apply with a paint brush, lambswool roller or airless spray gun. We recommend using a spry gun equipped with a nozzle 0.16mm to 0.63mm, classic ball pump piston, ratio 45/1 to 61/1, pressures up to 120 bars. 1st coat: Dilute the product with 50% water and apply. Let dry. *** To treat large cracks and expansion joints, embed ARCAMESH, between two coats of undiluted ARCAROOF. 3rd coat: If using ARCAMESH or to reinforce waterproofing, apply an extra coat of undiluted ARCAROOF. Let dry. Read our tips& advice explaining application and showing an illustration. Application can be done in 2, 3 or 4 successive coats (total coverage rates must be respected and each coat must be allowed to dry before applying another coat).